For the owner of the vehicle whose car engine is fast hot or the temperature is fast hot! 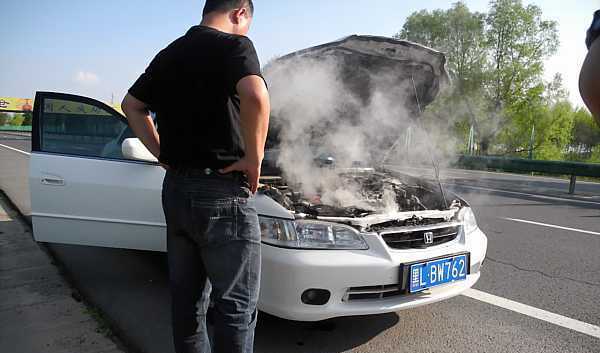 do not ever underestimate this problem and the worst result of a fast-hot car engine is an accident, the car can suddenly strike or even suddenly the engine stops amid high speed and must be the life of the stakes. But there is also a car when the road suddenly the engine died, strike and stop midway this can also be caused due to decoil / coil that is not normal, the coil is problematic when the engine is in a state of heat that happens is a dead machine, if the engine is cold turned on again. In general, the problem of fast heat car temperature is usually experienced by aged vehicles, but did not close the possibility can also occur in a new vehicle though, this is because many cars are like-minded reason by the unscrupulous for the sake of the price cheaper than the competition between sellers of new cars, for the sake of the difference of 1 to 3 million per unit some parts replaced with 2 kst quality, and the original stored for sale again. Based on experiences such as brake lining and new discs a month has been blurred, after being examined it turns out the spart part is not the original aka kw 3. So, be careful choosing sellers, do not be hooked at a cheaper but risky. Always make sure that the radiator is in good condition, 'not leaking', 'not clogged', 'not crusty', including a hose or that is directly related to the radiator. If due to radiator then take it to a radiator specialist or if necessary replace with a new one. Remember! that the liquid in the radiator rarely decreases when in good condition. Ordinary water / well water / groundwater in which many contain metal or minerals, in a continuous time will cause 'crust' on the element of adiator. Look for metal-free water, preferably with an air-conditioned distilled water or bottled water and a liquid coolant radiator. But if it has been for years using ordinary water and then you replace it with a liquid coolant can be even threshed crust in the radiator so it can clog.If you use a non coolant then a maximum of once a month should be replaced, I guarantee not yet 1 month the water must have changed color and cloudy. (periodic maintenance)If using a coolant, make sure you choose a quality and are regularly replaced. Unqualified oil will not be heat-resistant, because it does not withstand heat automatically oil will evaporate and decrease, engine lack of oil causes engine performance more rough due to friction, and continuous friction makes engine temperature faster and hotter than normal.If the oil is reduced quickly not because of bad oil, make sure the machine does not leak, not white smoky. If 3 things above normal, then make sure the fan runs normally and includes automatic switching contained on the cooling fan. It could be a weak fan spin, automatic switching is broken, which should spin him instead of dead. damage to engine components, etc. The thermostat is an indicator of the temperature gauge on the machine, making sure the thermostat is in good condition, the damaged thermostat will not produce the correct temperature accuracy.